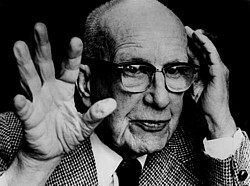 Buckminster Fuller (1895-1983) invented the geodesic dome, sort of. He was not the first to use the icosahedron for construction. Walter Bauersfield in 1922 in Jena, Germany built a planetarium that had suspiciously geodesic aspects. Moral: Whatever it is, if you do not give it a name and publicize it, it is not yours. Artist Kenneth Snelson, a student of Fuller’s at Black Mountain College, made the first “tensegrity” structure, in which metal poles that did not touch are suspended by wires. Fuller thought up the term and took full credit for the innovation. Moral: If you claim it and name it, it’s yours. Margaret Fuller, transcendentalist and early feminist, was Fuller’s great aunt. As a student, he was thrown out of Yale twice. Our Uncle Bucky – everyone called him Bucky — believed that meat was the best way for us earthlings to get good nutrition, and for long periods of time he ate only steak, prunes, Jell-O and strong tea three or four times a day. He made a habit of napping for 30 minutes after every six hours of work, falling asleep instantly. 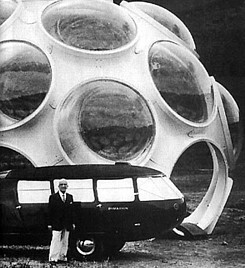 That Uncle Bucky managed to overturn his sleek, three-wheeled Dymaxion car is not noted in his 45-ton “chronofile” or in any public statements and writings. Nor was it ever revealed that, although parallel parking was a snap, moving out from the curb required backing up into traffic. The 3,500 standing orders for Uncle Bucky’s 1946 Dymaxion Dwelling Machine or Wichita House miraculously morphed in one of his interminable lectures into 35,000. Our Uncle Bucky believed that the decline of the traditional family and the apparent increase of homosexuality and bisexuality were merely the result of a reduction in the need for the species to reproduce. I was once persuaded to attend one of Uncle Bucky’s marathon lectures. How could I not have been intrigued? 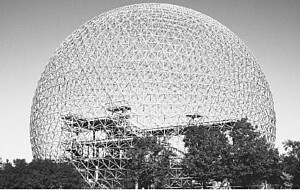 I thought the Dymaxion Car and then the Geodesic Dome at Expo 67 in Montreal were swell, in a Popular Mechanics kind of way. Bouncing around the stage, as advised by his dancer daughter, Bucky seemed more Barnum than beatific, more gasbag than gallant. Blather by any other name is still blather. Baloney is baloney. He gave a new meaning to Wall-of-Sound. I stuck it out for two hours and, deciding it was double-talk, and headed home to Hegel. the American Expeditionary Forces of 1917.
save over the Hell Gate of political doubt. What? Could you play that again? Oh, yes. Now I get it. Artopia likes the braiding, but dislikes “the Hell Gate of political doubt,” whatever that is. But then again, Intuition, another book-length “poem,” less full of filler, boasts a reproduction of a handwritten text from Ezra Pound on the frontispiece: To: Buckminster Fuller/friend of the universe/bringer of happiness /liberator./with affectionate admiration/ Ezra Pound/Spoleto/June 29th 1971. And what exactly was Pound autographing? A copy of The Cantos? Or perhaps a soiled napkin? A sure sign of the unhinged, along with unusual capitalization and hyphenating, is the invention of new terms and made-up words to cover data or meanings already adequately answered for by existing words and phrases. Neologisms can make you see things in a different light, but they can also cloud the brain, puff-up the inventor, and gain credit where credit may not be due. Neologisms can make something not-so-new or not-so-complicated seem newly discovered and wonderfully complex. I am not talking about puns or comic turns, as in Lewis Carroll or Gilbert and Sullivan. I do not mean witty portmanteau words, such as Carroll’s snark. I am referring to what can only be called Fullerisms. 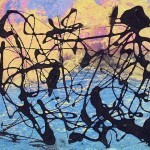 “Mind wind,” dreamed up by Fuller, is supposed to mean the feeling of “imminentness” when an idea is in the air. Or does it really mean mental flatulence and/or hot air? But how can you hate someone who actually coined the word debunk (in 1927) and came up with “Obnoxico” as his very own imaginary multinational corporate nemesis? I am not sure that allows us to forgive his grandest invented word synergetics, born of a forced marriage between “synergy” and “energetic.” It means, according to Fuller, “the performance of the whole unpredicted by an examination of the parts or a subassembly of the parts.” The word synergetics sounds meaningful, but the meaning doesn’t. It would be a great name for an oil company. The helpful Whitney handout bravely offers definitions of Fullerisms such as “Comprehensive Anticipatory Design Science,” “Lightful” and “Octet Truss.” But please note that the subtitle of the exhibition places the article “the” in front of “Universe,” whereas Uncle Bucky always insisted upon “Universe,” capitalized and article-free. Buckminster Fuller, that geomanic geocentric, believed (1) that the tetrahedron could solve all problems and (2) that the earth really is the center of Universe. He was an industrialistic engineerist who was mathemaniacally geometristic. He was ultimately globalistic, understanding that we are passengers on (his term!) Space Ship Earth, but blind to how to dispose of those doing the steering. He was the Pied Piper in a business suit. He was, in the name of the greatest good, an elf infected with predictomania and oracularitis. He was infected by neologorrhea, demonstrating that made-up words and new meanings forced upon old words can create another reality you might want to invest in, but not necessarily one you could trust. 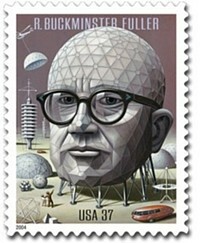 So what on Earth are we to do with Buckminster Fuller? The exhibition at the Whitney made me rethink Fuller’s place, his accomplishment, and his total nuttiness. Do we forgive him his eccentricities (perhaps insanities) because he came up with the geodesic dome, which has had some practical applications? Do his 20th-century proverbs compensate for the swill of his eight-hour lectures and his Synergistics tome? What was disarming about Fuller was his optimism and his idealism, however misplaced. He really seemed to believe that technology, specifically his version of same, would save the world. Progress was not only possible, but inevitable. Toward that end, unlike the dropouts constructing geodesic “drop cities” out of recycled materials, he had no qualms about dealing with governments of all stripes or with any willing corporate bigwig. Progress, he believed, would be top-down. His notion of autonomous housing, each unit producing its own energy through wind-driven turbines, predicted ideal off-grid lifestyles — still obtainable, alas, only by elite minorities. But his attempts at mass-produced housing show at least that his heart was in the right place, if not his brain. Fuller himself might have had more luck if he had pointed to the Airstream trailer rather than his own engineering. Oh, no, he had to predict high-tech igloos delivered by military helicopters or revolving aluminum nests perched on poles. The problem with those kinds of “practical” housing is that they don’t film very well. What movie star – and we all see ourselves as such – would want to live in a hut? Even one made of aluminum? You can’t film actors and actresses taking sponge baths in broom closets. Fuller seems to have been looking a little too hard at airplanes. Although you can make a dramatic airplane exit by walking down those retractable steps onto the tarmac, you cannot make an entrance by entering one. There is no foyer, no nightclub platform from which to descend. There’s no room inside for a camera crew. And where in any aluminum yurt is there privacy? I am not qualified to judge if Fuller’s geocalia is correct. For all I know, 60 degrees, as he claimed, and not 90 may be indeed the basic angle of Universe. In any case, in terms of geodesic domes, I imagine it is difficult to place paintings, mirrors, video monitors, or bookcases on a concave, faceted wall. Most people don’t want a space that’s created by a leaky, echoic, floor-to-ceiling dome. If forced to give up flat walls, they’d rather camp out in a tent. Or a sleeping bag under the stars. But at least our Bucky tried. Tried to see beyond the tried and true. Tried to seek out logical first principles. Tried to solve the problems generated by pseudo-scarcity, bad design, abuse of resources and bad faith. In some ways he was fearless. He was not afraid of appearing foolish. Perhaps he was so self-centered that any vision of his own foolishness never entered his head. Perhaps he was blessed…with naiveté. He was an Artopian ahead of his time.